For those that would love to convert their own bridle to bitless and give their horse the comfort of a USA Beta Biothane noseband. Make use of those bridles you have at home by converting them to bitless giving you options for fitting different size horses and ponies, and bridle styles - including driving bridles. The Bitless Noseband consists of the LightRider noseband with cheek piece attachment points, webbing chinstrap and connector strap with leading ring. Simply attach it to the cheek pieces (fits most standard 5/8" to 1/2" cheek straps) instead of a bit, and you have a LightRider Bitless bridle at a more affordable price. 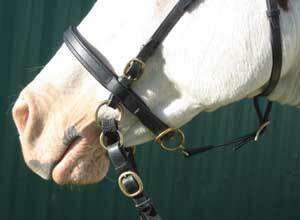 The Light Rider Bitless Noseband allows you to go bitless in your own favourite bridle. Make use of those bridles you already have by converting them to bitless, giving you more options for style and fit. The purpose of the soft webbing chin strap is to help the noseband stay in place when pressure is applied to the reins - this keeps the noseband from twisting to give clear and direct communication. When rein pressure is applied the chinstrap becomes snug but does not over-tighten due to the type of webbing used, so 90% of the pressure is on top of the nose. Materials: Comes in Black or Dark Brown regular USA made Beta Biothane with stainless steel hardware. Scissor rein clips are recommended for easy change over to the leading ring which enables groundwork/leading/lunging, or buy LightRider reins with clips included to have the correctly weighted reins designed for this bridle.